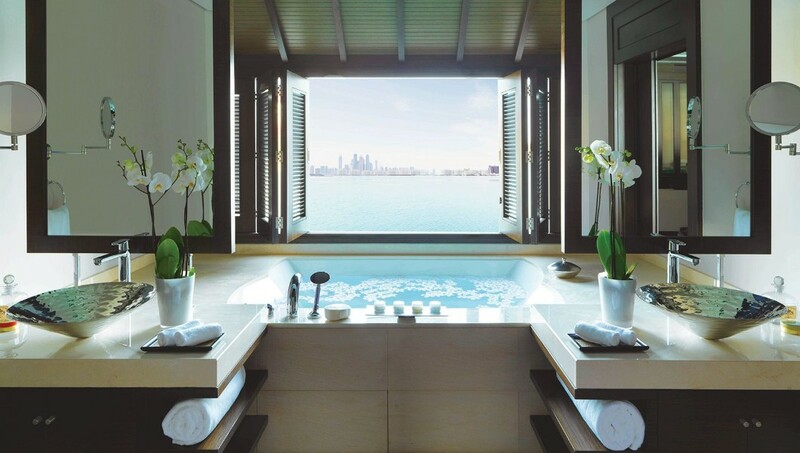 If it wasn’t for the distinctive skyline on the horizon, your stay at Anantara The Palm Dubai Resort could pass for an exotic Thai resort. Located on the crescent of the iconic Palm Jumeirah, the sprawling estate is a medley of pagoda style rooms and villas, lining turquoise lagoons, lush gardens and a 400-metre stretch of pristine beach. Thai traditions are woven into the fabric of the hotel, from electric tuk tuks that zip you around the resort to the traditional longtail boat, shipped over from Thailand to ferry guests over to Dubai Marina. The resort is famed for its unique lagoon villas – the only accommodation of its type in the region – but this beachfront is where we lay our scene. Once you’ve weaved your way through the resort, past the lagoon-access rooms and the 50-metre infinity pool, you’ll reach the shore but the route doesn’t end there. Spaced out evenly along a sturdy wooden jetty, two rows of over-water villas face the Gulf waters, jutting out from the sand. 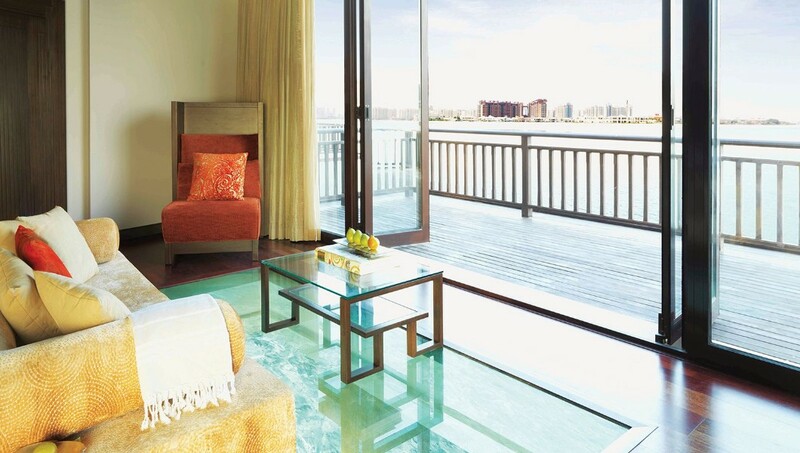 The wooden cabins embrace the aquatic environment with glass panel sections in the floor so you can wave to the fish, and a balcony area with a pair of sun loungers and a day bed. There’s even a swimming pool-style set of steps for you to ascend and descend into the salty water below, but given this is “winter” in Dubai, it may be better to wait until the summer sun raises the Gulf’s temperature. The villas are the first of their kind in the Middle East where you’re surrounded by blue hues and can wake up to stunning sunrises. You can spend your days suspended over the waters on the terrace, opposite the bed, or unwind with your loved one in the 106 sqm villa. You can even drink in the views as you soak in the mammoth tub, with a Villa Host on hand to tend to each and every need. Your accommodation places the cosy king bed in the centre of the bungalow, with the desk, mini-bar and fridge at the rear. There’s ample space to roam around with a chaise long tucked in the corner of the room, with a TV set and a phone to contact your butler. To the right of the bed is the bathroom with the aforementioned bathtub and double vanity units. If you’ve ventured into the sea, you can also wash away the salty residue in the rain shower before slipping into your plush robe and prepping for dinner. A weekend experience with Anantara wouldn’t be complete without a visit to the brand’s signature East Asian restaurant. Mekong is more apt a name than it appears at first glance. The epic river of the same name flows through five East Asian countries: Thailand, China, Laos, Cambodia, and Myanmar – representing the pan-Asian cuisine on offer. The concept can often indicate a lack of specialism in any one cuisine but this venue is a taste tour of the Far East’s greatest hits. The Mekong Sharing Platter is a handy starting point to whet your taste buds but keep an eye out for monthly specials and be sure to dine al fresco if the weather allows, with quirky tuk tuk-style tables. If you’re fearful of spice, just make sure you clarify what your taste buds can handle – and be prepared to add a new notch in your belt when you get home. The eatery currently has a special offer for a dusk dining experience. The “Mekong Twilight Offer” allows you to select your tuk tuk seat and enjoy views of the Dubai skyline, absorbing the last rays of the day. Sip on selected beverages and nibble on the chef’s signature appetisers from 5pm–7pm most days, priced at $49 for two people.